In the world of ultra long distance motor racing Denmark’s Tom Kristensen is a legend. Driving in the famed LeMans 24-hour – think four-and-a-half Bathurst 1000s back to back – Kristensen has finished 15 times, and been on the podium 15 times. For nine of these races he and his team-mates were on the top spot of the podium. In an eerie similarity to Kristensen’s nine LeMans wins, Australian racing legend Peter Brock took out nine Bathurst victories. Despite several further attempts neither of these brilliant drivers managed to get into double figures. Seven of Tom Kristensen’s victories were in Audis so the German car maker invited the now retired driver to Australia to take part in the latest version of the Audi Sport Driving Experiences program. It was held at the brand-new The Bend Motorsport Park near Tailem Bend about 100km south-east of Adelaide. This is the first new dedicated circuit in Australia for almost 20 years and is an impressive undertaking with a main circuit that’s second only to the Nurburgring in length. In a previous life this area housed Mitsubishi’s proving ground before the company stopped making cars in Australia. The Audi Sport Driving Experience is a serious sweating-in-the-driving seat event that is run worldwide. Always held away from public roads and generally at racetracks, often using a skidpan to learn how to get a car out of shape and regain control again. There’s also as strong serving of on-track driving. This Experience is just one of many Audi high-performance events that cover everything from improving yourself as a daily driver, to full-on amateur racing in Audi R8 racing machines, with various intermediate steps. See audidrivingexperience.com.au/ for details. A number of Australian motoring journalists were invited to the latest of many Audi driving events that have been run in this country over the years. 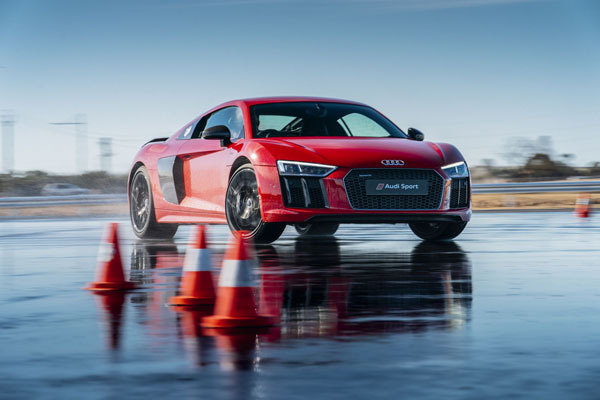 The Sport Experience includes emergency manoeuvres, theory and practice of safe high-speed handling and demonstrations of the abilities of Audis quattro four-wheel-drive system. 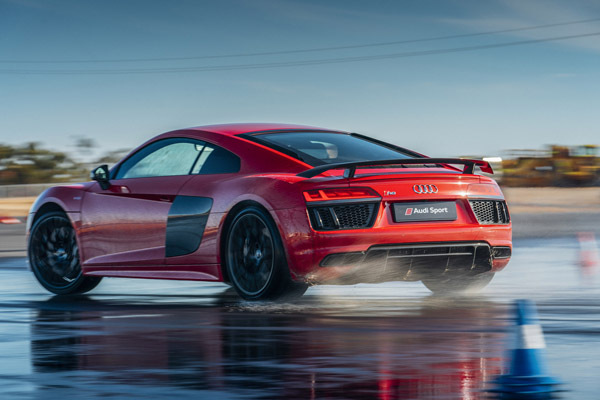 Interestingly, though Audi makes a big thing about its quattro all-wheel-drive system, we were also able to drive the new Audi R8 rear-wheel-drive model to check the difference between them and the quattro when driven to extremes on drifting exercises. While the differences are noticeable you really only feel them if the sports machines are going hard. We then did some laps of The Bend, which is surely one of the most complex layouts anywhere on the planet. The laps were initially done one-on-one behind a lead car to learn the best braking, turn-in, apex and acceleration points, then we were allowed to do some on our own. However there was no lap timing and no racing. That doesn’t come until you’re several further steps up the Audi driver training ladder. The day was exceptionally well organised by Audi, using almost-a-legend Steve Pizzati who we have worked with several times before. Keep an eye out for his name if you’re planning any track days or similar. After the journos had various lessons and competitions we not only felt that our driving was just that little bit better but reminded us, not for the first time, that we were a long way down on the skills of the professionals. After the opening event we attended, Audi and Mr Kristensen stayed on for the best part of a week to cater with different levels of driving lessons for keen Audi owners. We can highly recommend any of the Audi driving experiences if your the owner of one of these technically advanced German machines.